Two up-and-coming golf club companies — wedge maker Indi Golf and putter maker Sacks Parente — are making big pushes in the battle for short game success. Just take a look at their new products. Indi Golf’s new ATK Grind wedges give players more shot-making options. The ATK Grind has been designed with more heel, toe and trailing edge relief to allow for increased shot making. This allows the player to open the face and the leading edge will remain the same distance from the ground as if in a square club face position, yielding a consistent look and increased confidence. “This new grind is an addition to our current grind that has been very well received and successful,” added Lang. The ATK Grind is designed with Indi Golf’s ScoopBack, TractionFace, and LaunchControl technologies, maintaining Indi’s legendary forgiveness, spin, and control. The ATK Grind will feature a new matt black finish and will be available in both the StingRay and StingRay TT models. Indi Golf’s proprietary ScoopBack design creates maximum forgiveness by moving mass higher in the face, and toward the toe. This optimizes the location of the club’s CG, making the head more stable on off-center contact, helping shots feel better, go straighter, spin more and end up closer to the hole. The ScoopBack design is not a muscle back or perimeter-weighted design but is a combination that brings the player the best of both worlds. TractionFace technology uses a proprietary open square groove shape and pattern to create tremendous backspin and optimal launch conditions. These aggressive box grooves increase spin by 50 percent and are so effective that the StingRay wedge exceeds the performance limits outlined in the Rules of Golf, making them ideal for recreational golfers. StingRay TT remixes TractionFace technology with another revolutionary groove shape and pattern to optimize launch and increase backspin by 20 percent on a full swing while conforming to the Rules of Golf. LaunchControl — A lower launch and higher spin combination allows golfers to be more aggressive and reduces the influence of elements on the ball. ShortHosel — Creates discretionary weight that has been position higher in the face and more towards the toe, resulting in higher performance, better feel, and more forgiveness. Optimized Bounce — Allows the head to glide through the turf yielding solid contact for the grooves to grab the ball and impart maximum spin while producing ideal launch conditions. The ATK Grind StingRay TT Wedges are available in 50, 52, 54, 56, 58 and 60-degree lofts. They conform with the Rules of Golf. The ATK Grind StingRay Wedges are offered in 50, 52, 54, 56, 58, and 60-degree lofts. They do not conform with the Rules of Golf. $159.99 for all models. For more information, visit www.indigolfclubs.com. Sacks Parente Golf Company introduces its innovative new Series 39 blade putter. 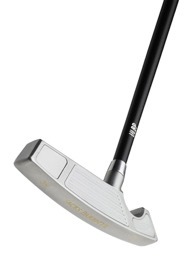 Available in both a Players Edition and a Tour Edition, the Series 39 putters feature Sacks Parente’s patented Ultra Low Balance Point (ULBP) technology that lowers the balance point along the shaft between the sole and a point not more than five inches above the sole, causing the putter head to square and release at impact, delivering exceptional rollout and accuracy. The Series 39 features extreme perimeter weighting using lightweight face inserts along with more tungsten in the toe and heel than any other putter, resulting in a true blade with a higher MOI than most mallet putters. The flawlessly balanced 39 features a perfectly placed center of gravity which stabilizes the head while in motion and through impact, eliminating gear effect and side spin. The result is an exceptional putting instrument that will allow golfers of all skill levels to make more putts. The Series 39 Tour Edition is made from 316L surgical steel, featuring a light weight face insert made from AL24, Sacks Parente’s proprietary alloy material, that absorbs vibration 100 times better than steel. To maximize the MOI, the Series 39 has over 120 grams of high-density tungsten strategically located in the faces at the heel and toe. Sacks Parente has numerous patents and patents pending in regard to the science associated with their game-changing putter technology. Sacks Parente uses a standard head weight of 350-360 grams and has focused on technologically advanced shaft and grip design to solidify their ULBP technology. The shafts performance at less than one-third the weight of a typical steel shaft is an engineering marvel that translates to more putts made. At an average weight of 30 grams Sacks Parente grips are less than half the weight of typical grips found in today’s market. They are engineered to enable the ULBP technology, and to also meet the SPG specific requirements for feel and comfort. They come in three variations, to meet every golfer’s unique grip style.